(Updated Thursday with additional information. For new version of AB 484, go here). In order to avoid serving two masters – the old state academic standards and the new multi-state Common Core standards – state leaders are now proposing to discontinue nearly all state standardized tests next spring, including English language arts and math. Instead, districts with technical capacity will be required to give a field or practice Common Core test to prepare for the test’s official introduction in spring 2015. 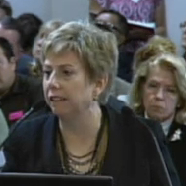 Deputy State Superintendent Deb Sigman explains plans for a Common Core field test to the State Board of Education on Wednesday. The new plan significantly expands what Superintendent of Public Instruction Tom Torlakson had proposed in Assembly Bill 484, sponsored by Assemblywoman Susan Bonilla, D-Concord, which would reduce the number of tests. Besides legislative approval, it will require a waiver from the U.S. Department of Education, since the state would suspend tests – English language arts and math in grades 3 through 8 and grade 11 – required for federal accountability under the No Child Left Behind law. The State Board of Education unanimously voted Wednesday to seek the waiver in concept, even though it didn’t have all the details – specifically amendments under AB 484 – before it. Deputy State Superintendent of Public Instruction Deb Sigman acknowledged that federal officials haven’t indicated whether they’d give permission, since the state is asking for a broader waiver than U.S. Secretary of Education Arne Duncan had envisioned. In July, Duncan announced that, to avoid double testing, he’d grant those schools doing a Common Core field test an exemption from state tests in those subjects. Schools affected would use last year’s test results for NCLB purposes. But Duncan had in mind the 20 percent of students needed for a scientifically valid field test. Torlakson and state leaders want to extend that opportunity to full districts, with half the students taking math and the other half taking English language arts. The state would pay for administering the Common Core tests with the savings from not giving the California Standards Tests. (Los Angeles Unified and the other districts in the California Office to Reform Education want to offer both parts of the test to all students with state funding.) Those districts without the computing capacity to do the computer-based Common Core tests would offer no math or English language arts test for accountability. Districts that wanted to continue to do any of the suspended tests, such as Algebra I or high school science tests, could do so on their own dime. The plan was hashed out through negotiations with Torlakson’s staff, the Brown administration, State Board members and legislative leaders over the past month. Torlakson said he favored a clean break from the old standards: The aim is “not to look in the rear-view mirror, but to really move ahead,” he said. Sigman said the field test would offer teachers a “rare opportunity” to become acquainted with the new, more challenging Common Core tests. Districts will have a trial run for administering a computer-based test. State Board members didn’t need convincing. Suspending other state tests “sends the clearest message possible that we are serious about implementing Common Core standards,” said State Board member Sue Burr at the board meeting Wednesday. The only state tests that will be given next spring will be science tests in grades 5, 8 and 10, which are required by the feds, the California high school exit exam, an alternative test for severely cognitively impaired students, and 11th grade exams used for determining placement in California State University and some community colleges. Schools, districts and Individual students will not get scores back from the field test, Sigman said, because it primarily serves “as a test of the test.” It provides reliability data to the Smarter Balanced Assessment Consortium, the states-led developer of the test. California is a governing member of Smarter Balanced. Suspending most state tests and using the Smarter Balanced field test for Common Core will all but certainly result in a gap in producing the annual Academic Performance Index, the primary performance indicator for schools. It will also mean that parents will not be getting standardized test results this year, with a few exceptions, and schools will not be graded on them as well. At the State Board meeting, representatives of several children’s advocacy organizations expressed unhappiness with that prospect, while also endorsing the Common Core field test. Valerie Cuevas, director of external relations for Education Trust-West, said that the state tests provide critical information on which schools are improving and raising student achievement. “Assessments have to be continued, without a year off, for us to do our work,” she said. Doug McRae, a retired standardized testing company executive, was more accusatory. 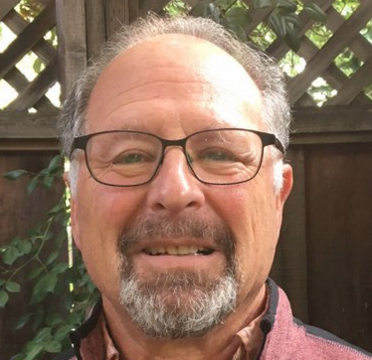 A lone voice calling for a gradual transition to the Common Core assessments without a hiatus in producing annual test scores, he called widespread use of the field test “an anti-accountability Trojan horse.” It suits those who have opposed using standardized tests to hold schools accountable, he said. The state must design new K-12 tests for the multi-state Next Generation Science Standards that the State Board adopted on Wednesday, new high school math tests aligned to Common Core, new Common Core-aligned tests for English learners and eventually new social studies tests. It will likely be at least three to five years before some of the assessments are revived. AB 484 will require the state Department of Education to present a master plan for all state assessments to the State Board by March 2016. All this chit-chat about implementation, need for tech streamlining, obstacles to achieving a better result, bandwidth, i-pad distribution issues, whatEVer -completely ignores the central concern of families with children in the public schools: How did my kid do last year? How did my kid’s school do last year? Public accountability is expected to be put on hold? For how long? Three to five years? That’s a long time to wait to know what’s strong and what’s weak in a child’s education. Long enough to get people used to the idea of not finding out, not knowing, not asking. Long enough not to have to incorporate any student test results in teacher evaluations. A Trojan horse? Say it isn’t so! What way is this for the State of California to be running its system of public education? Governor Brown should be demanding a much better mousetrap. It is my unprofessional opinion, Ms. Zimmerman, that you are sadly mistaken if you think that CSTs can tell you how your kid is doing in class. Or whether the school is competitive with, oh, the fanciest private school in your area. We know that tests do not summarize a school experience, but they provide some ballpark parameters for how a kid did in various subject areas over a year’s time. And tests results provide a picture about the school’s performance relative to other schools in the same socio-economic niche. Parents appreciate this timely information. Please note the results reported after this story was written about a recent CA poll showing that people think tests and reporting test results are important, contrary to the common assertions educrats and politicians. Manuel, your comment that “we all grew up without standardized tests and we came out okay” is possibly the most anti-intellectual posting I ever have read on EdSource. I invite you to share when you graduated from high school and to how many years back your memory hearkens. I graduated in 1983 and now have two kids. Are we peers? Or do you come from the era when skin color segregation and separate drinking fountains still were legal? Is that the kind of “okay” to which you refer? The data California now has can compare straight-up the proficiency levels of students at different schools in school districts as well as comparisons across the state. Parents want to know about the quality of schools in their neighborhoods. Kids have higher expectations than decades ago. College readiness for many students requires SAT success, AP exams and completion of a preparatory curriculum. Does your “came out okay” comment refer to kids who need migrant education? How about children at schools with significant gang activity? Children of low Parent Education Levels (PEL)? How about Socioeconomically Disadvantaged (SED) kids? Students who are English Language Learners (ELL)? I could go on but it doesn’t take much to show that even California has a long history of racial success differences – in neighborhood resources, in schools, in safety, in opportunities. Standardized test scores put those differences in writing, on computers, in – our – faces so community leaders and decision makers can – not – hide behind yesterday’s aged memories! Life in 2013 is intense and today’s California students compete with a much broader group of internationally-born peers. Some neighborhood public schools have figured out proficiency better than others. Children of families without real property will have to strive and strive to succeed in this economy – jumping to compete for increasingly scarce resources. Manuel, for many reasons the kids at the “fanciest private school in the area” do have a jump up on future university admissions over most public school kids. That’s straight-up, cold-water-in-the-face reality. Frances is correct that many, if not most, parents want to know these numbers. California is moving up its timetable for the new computerized tests by a year, leaving some school districts scrambling to prepare. Schools must have enough computers available on each campus to handle the testing, for example. Until now, state standardized tests were conducted entirely with pencil and paper. L.A. schools Supt. John Deasy didn’t want instructors teaching to the old test while also having to prepare for something new. For weeks, he’s pushed behind the scenes for permission to move the nation’s second-largest school system entirely to the new test and students would take the new exam on iPads that he intends to provide to each of them. which doesn’t make sense since iPads for all won’t happen until 2014-15 and only if the piloting schools don’t have problems. But this article parts the curtain a little: Deasy does not want teachers teaching to the old test but to the new one! So it is true: teachers have been pressured to teach to the test contrary to assertions to the contrary. Some school districts may have a problem simply giving the tests because of out-of-date computers or a shortage of those that work at all. Officials acknowledged this would be a challenge to work through. Fun times, Manuel. Still plenty of California schools with only limited bandwidth. Not having the computers is solved with a weekend binge at Staples or Amazon from last minute angel money. Bandwidth… not so much. Are these tests going to be Open Google, open apps, open files? If not… was there someone with some sort of plan for who exactly will wipe the devices before the tests are administered and then restore the kids’ files after? Or dedicated devices that will be used exclusively for testing? Despite my snarky comment, I think this is absolutely the right way to play the cards that are dealt. Spending resources on the new tests instead of the old is good. Accelerating the drive to set up our schools with technology is good. Preventing a situation where the kids are taking both sets of tests together is good. And breaking up the continuity to avoid the destruction of good and beneficial schools because 100% of the kids are not proficient this year as required by law… is also good. However, it really is long past time for someone who knows something about deploying and managing large IT operations to assess these plans and have the ear of state officials who make the rules and control the purse. Yes, this is the way to play the hand that has been dealt. By taking this fork on the road we will certainly know what a disaster it is to run this type of grand scale social experiment. OTOH, who is going to keep track of what goes wrong and what goes right? This problem is akin to reality TV: the editing process is used to create drama (or farce) by juxtaposing and/or eliminating events. I don’t doubt that we might get a glowing report at the end telling us how well it worked and not a peep about the problems and shortcomings. As I posted in another occasion, the power requirements are going to be daunting if districts go with stripped-down pcs. The problem with using tablets and/or something like GoogleChrome is that these machines’ browsers are not designed to easily handle the standard interface (plus their batteries must be recharged!). In fact, many web sites have “mobile” versions. This fact surfaced at a recent LAUSD meeting on the Common Core where it was pointed out that using the “touch-pad” keyboard in the iPad would “obscure” parts of the test question. Naturally, they are now scrambling to figure out if everybody needs external keyboards to take the tests. Another thing they are not paying attention to is how the test is presented on the screen. On a regular computer, you just point with the mouse. In a tablet, you generally use your finger, which is often too big to allow you to choose between closely located “buttons.” Will the test makers allow for these and other issues that will surface? The entire technology side is a nightmare and I have not even started questioning bandwidth! This entire mess is reminding me of the problems exposed by Richard Feynman during the Gordon Commission. He found out that NASA management mostly never did talk to NASA engineers and always did what was politically convenient. Here we have state and district officials making grandiose plans without checking with the techs to see whether it can be done with the level of reliability needed within the costs they can afford. Insanity but I am not surprised. Perhaps since you work within a small district you can get these things down on paper. If you can circulate it among districts of your own size maybe you can build enough critical mass to force the state officials to pay attention and either throw money at the problem or change the mandates. I think the first piloting group for the tests should be the state school board and the state legislature, and then we should probably have all the various district and county school boards and superintendents take them next, before they are deployed for any students. They need to experience the logistics first hand, and in their local community, in the place the kids would take the exams. The place with inadequate air conditioning and 30 computers running. The place where the desks aren’t quite big enough to run a computer and a pencil and paper – because you might need to do scratch work to answer the questions. The place where the bandwidth might fail. The place where glare from the windows makes the screens unreadable. The place where beep error sounds are either missing or distracting, depending upon how it is set up. And we need otters to try to game the systems right back. To try to cheat on the exams in various ways. To figure out how to rush through the exam and then play Minecraft for the rest of the period. In fact, we should recruit kid volunteers to do exactly this against a test system, and then when that system operates the way we like, we should release the scripts that build the network and the machines to create at least one kind of useable arrangement. Maybe they should ban you from the school site when testing is taking place. Who knows what prank you will pull! Or they could hire you as principal consultant (black hat division). Better to learn in 2014 than a year later, when it “counts,” no? We should have given these to LAUSD’s 6th and 9th graders last year to get a feel for how they will ‘align’ with the CSTs. Anyway, seems unlikely Duncan would go for this. While he would probably be happy to see the move toward CC assessments, he probably wont like not having any accountability at all (except for districts with means). It would be nice to know how much would be saved, and how what kind of bite the CC tests would take out of that..